Pride and integrity, along with vision and talent, has kept Millwork One in the forefront of the premium architectural millwork and casework arena. Millwork One’s recent completion of the remarkable Residential Colleges marks a major milestone as one of the largest millwork projects ever completed in New England. Mathworks recently acquired the new Lakeside Campus (formerly Boston Scientific) in Natick, MA, for the development of a completely new campus, which includes two new office buildings, an amenities building, and fitness center, totaling 550,000 square feet. The project team of Consigli Construction and Gensler Architects have awarded the architectural woodwork package to Millwork One. 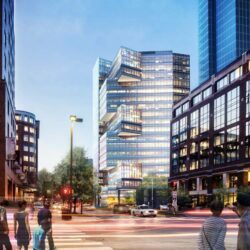 Spearheaded by Related Beal, LLC, and co-designed by Robert A.M. Stern Architects and Stantec, construction of 131 Beverly at Lovejoy Wharf will yield 175 condominiums for sale totaling 210,000 square feet of residential living. Located where Boston’s Harborwalk will connect to the Freedom Trail, the building constitutes a gateway to the city from the north over the Bunker Hill Bridge. In 2014, our 25th year of business, Millwork One made strides in our green initiative pact to become a responsible partner in helping preserve the environment and natural resources in New England and beyond. Boston College’s much-anticipated $200 million recreation center will consist of new construction of a 244,000 square-foot, four-story facility. Spearheaded by Construction Manager Skanska USA and Cannon Design with the architectural woodwork manufactured and installed by Millwork One, when completed it will be state-of-the-art athletic facility. Boston Harbor will soon be the home to the new Residences of 50 Liberty at Fan Pier. 50 Liberty boasts spectacular harbor views, lush parklike landscaping, and a harbor walk to complement its spacious and luxurious interior. The dynamic 50 Liberty will represent the best of 21st century Boston. Delaware North, along with partner Boston Properties, has a massive expansion of the 23-year-old arena taking place over the next two years. The original site of the Boston Garden is now home to The Hub on Causeway, serving as the new front door to TD Garden and providing a historic opportunity for the arena expansion and re-imagination of spaces and amenities. Upon completion, this new Campus Center will be a dynamic center of university life, enabling the greater Harvard community to come together in new and exciting ways. The design includes flexible indoor and outdoor gathering spaces, meeting and event spaces, and lounge and study areas. It is part of a multiyear effort to create and improve common spaces across the university as a way to ensure its physical spaces as well as to foster the intellectual, cultural, and social experience. 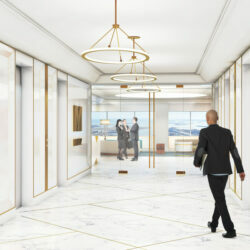 Mintz Levin Attorneys has hired Suffolk Construction and Elkus Manfriedi Architects to renovate 6 floors of its One Financial Center home office totaling 205,626 square feet. Millwork One Inc. was asked to provide design assist services for the complex woodwork components and produce multiple in place mockup offices. 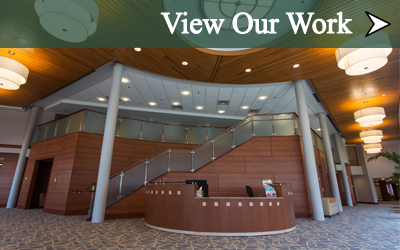 We were ultimately selected to provide a turnkey architectural woodwork package. The space holds in excess of 500 custom wood office fronts as well as many other ornate architectural woodwork items. Akamai’s new 486,000 SQFT Global Headquarters is part of a $700M agreement with Boston Properties to demolish the existing structure at 145 Broadway to make way for the new headquarters. Turner Construction with Sasaki Associates have teamed up on this prestigious project in the heart of Cambridge’s technology hub.